My mom unfortunately has a slipped disc in the cervical vertebrae of her neck, which causes a wide array of symptoms when the nerve is pinched — a mixture of insomnia, nausea, numbness, and dizziness. It was extremely apparent during my visit home to San Diego over this past Thanksgiving, when her usual energetic self was notably deflated due to a variety of pinched nerve symptoms. Doctors were recommending corrective spinal surgery which, in a worst case scenario, could leave my mom partially paralyzed. I felt powerless, but I knew I had to try to help alleviate the slipped disc. I had the privilege of taking a design studio course taught by Scott Klemmer and Don Norman towards the end of my time at UC San Diego, where we were taught to practice empathy in order to cultivate an understanding of the user, their needs, and pain points. In my mom’s case, her pain points were literal, yet I sought to apply the same framework of design thinking which is normally reserved for user interfaces and digital processes. I sought to gain understanding of my mom’s environment and circumstances which might lead to the aggravation of her slipped disc. Through further discussion with my mom, I learned that when she had a “good” night of sleep, her symptoms were significantly less severe. Incidentally, she had tried and dismissed nearly fifty different pillows due to their failure to be both comfortable and provide adequate neck support. A couple weeks later I lay in bed, and having swam earlier in the day it hit me that the ideal pillow would be similar to the experience of a floating in a pool. The key here was that buoyant force was spread across the entire submerged surface area. 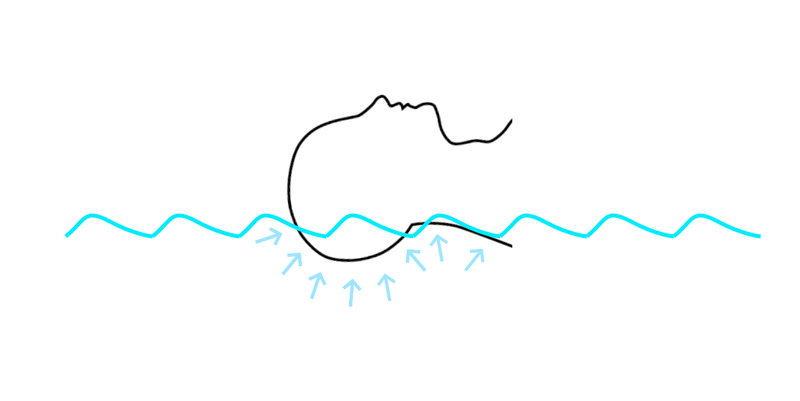 I shot out of bed, flipped on my light, and set to work sketching out a memory foam pillow featuring variable density, allowing the head to sink into the cushion while simultaneously providing more firm support to the neck. Upon validating my design with a UC San Diego structural engineering professor, I created my own prototype crafted from sheets of memory foam. A month later on Christmas day I was happy to present my mom with a custom fit pillow which stabilized her head and neck, and the results have been very encouraging — she is now able to more consistently sleep through the night and as a result her pinched nerve symptoms have been occurring less often and with less severity. This experience of applying design thinking to new arenas outside of digital interfaces was an extremely powerful experience, demonstrating that applications of design thinking could create transformative products and services for individuals affected by illness and injury.